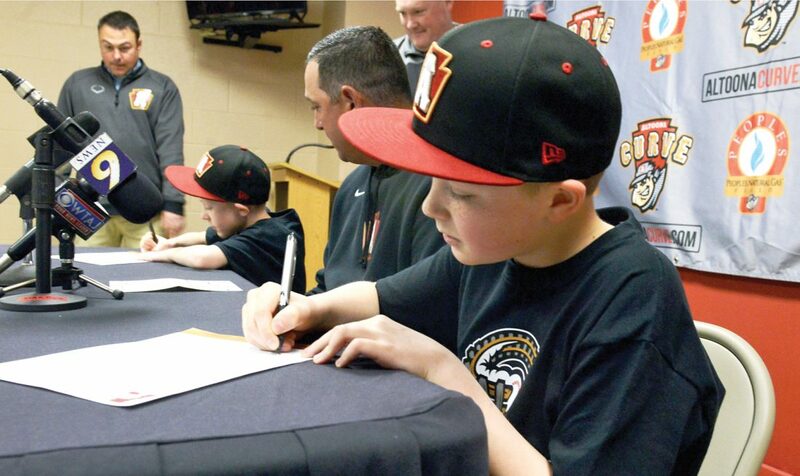 Gary M. Baranec / During the Altoona Curve’s media day activities, brothers Cameron (left), 9, and Brennen, 12, Yingling of Martinsburg sign contracts, making them honorary coaches for the season. Watching them (center) is Curve Manager Michael Ryan. Brennen and Cameron Yingling are like most young brothers — they goof around, enjoy playing baseball and pester each other all the time. The “it” their dad referred to is what makes life more challenging for the Yingling brothers from Martinsburg. They suffer from a genetic neuromuscular disorder called Friedreich’s ataxia, a debilitating disease that progressively leads to impaired ability to walk and usually requires a wheelchair. Vision impairment, slurred speech and often times a life-threatening cardiac condition called cardiomyopathy are also symptoms. 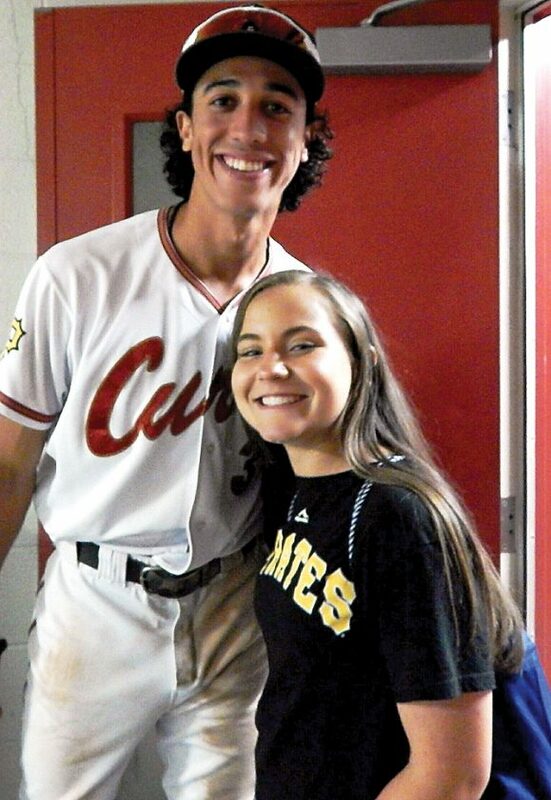 Courtesy photo / Taylor Mowry, 14, poses with former Altoona Curve shortstop Cole Tucker, who now plays for the Indianapolis Indians. Mowry, who suffers from a disease called amplified musculoskeletal pain syndrome, will sing “God Bless America” during the seventh inning of the Curve’s opener. For many young boys, being around baseball is a normal part of life. And thanks to the Altoona Curve, Brennen and Cameron will get to experience that this season as honorary coaches for the team. The Curve play their home opener tonight, and the Yingling boys will be on hand at Peoples Natural Gas Field, as they will for a good number of games this season. Curve manager Michael Ryan, who has sons similar in age to the Yingling boys, said he’s excited to have the brothers be around the team and taking part in various activities throughout the season as honorary coaches. Ryan had fun with the kids after they signed their coaching contracts during the team’s media day last week. The Curve also are doing something special tonight for another area youth who’s battling a rare disease. Taylor Mowry, a 14-year-old eighth-grader at Claysburg-Kimmel High School, will sing “God Bless America” during the seventh inning. Taylor suffers from a disease called amplified musculoskeletal pain syndrome, a condition that causes intense pain throughout the body in children. Taylor said she’s “ecstatic” to be able to sing at a Curve game. She’s tried out for the National Anthem in the past, but this will be her first time to perform at the ballpark. Taylor has a feeding tube and usually is in constant pain, but she tries to remain positive and always smiles. “It’s going to be a very proud moment (seeing her sing tonight) because her goal is to inspire others, to show them that they can actually do whatever they set their minds to,” Taylor’s mother, Laura, said. Taylor already has been inspired by one former member of the Curve — shortstop Cole Tucker, who was with the team the past two years. She and Tucker developed a friendship, and even though he’s now moved on to Triple-A Indianapolis, Tucker still texts Taylor frequently to find out how she’s doing. “We actually went this (past) weekend to see him play in Ohio,” Taylor said. “We were ecstatic to see him, and he was ecstatic to see us. Curve general manager Derek Martin said the team is always looking for ways to help people throughout the region live out their dreams at the ballpark. 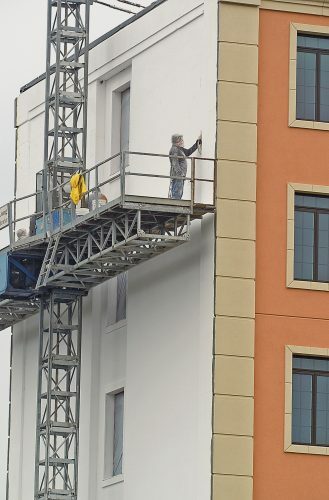 “I can’t put into words how much this means to the Curve,” Martin said. “Helping the community is why we are here. Providing a platform to get the word out is the least we can do for those in need.